India will be squaring off with Belgium in what will be the 10th match of the Hockey World Cup 2018. It is the clash of the titans in Pool C and the result in the upcoming match will play an extremely crucial role as it is likely to decide which team will progress to the quarterfinal stage directly and which one will have to play the crossover matches. Hosts India got off to a flier at the 2018 Hockey World Cup. A timid South African team was no match for the prolific Indian strikers as they slumped to a 0-5 defeat. The only downside for Harendra Singh and his boys in their match against South Africa was that they were unable to convert any of their penalty corners due to poor execution. 24-year-old midfielder Simranjeet scored a brace, Lalit Kumar Upadhyay scored 1, star forward Akashdeep scored 1, and the Punjab-born defender Harmanpreet also found the back of the net in the match against South Africa. There were more positives than negatives India can take from their first match. It is always good to begin proceedings in any tournament on a winning note but Harendra Kumar and his troops took it a step further by completely outclassing their opponents. However, doing the same against Belgium will be a difficult task as they are a much stronger team. Belgium are currently ranked 3rd in the world and are amongst the select few of the national teams which have grown in stature by leaps and bounds in the past decade. The Red Lions were the runners-up at the 2016 Rio Olympics. They also started their 2018 Hockey World Cup campaign on a winning note by defeating Canada 2-1. However, this victory was not as convincing as their usual standards, which the team have set for themselves. Shane McLeod's side held possession really well and were rotating the ball around with intent in the opposition (Canada's) half. Even though Belgium won 7 Penalty corners, their inability to convert any of them are some worrying signs. Captain Thomas Briels would have to ensure that his players are even hungrier for goals against a team like India. There were, however, many positives that Belgium would take away from the match. The first of this will be to hold the ball well and build up play in such a manner as to ensure a circle entry with every other attack. 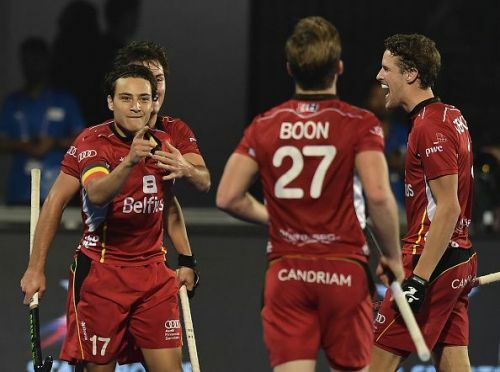 Felix Denayer, Luypaert, and Tom Boon were fantastic in the match against Canada and they will need to ensure that they maintain the same form against India in case they want to give their team a chance. The captain Thomas Briels has been leading from the front and he will look to inspire his side in the all-important clash against India. A jam-packed stadium in Bhubaneshwar will surely give the Indian team the edge over Belgium. India's strikers are looking in sublime touch and Belgium's defensive unit will have a busy day at the office. Even though Belgium have a higher World Rank of 3 compared to India's 5 -- a win in their own backyard seems unlikely. The home team is expected to cruise to a narrow victory in the match. India finished at a lowly 9th place at the 2014 edition of the World Cup which was held in The Hague, Netherlands. The Bharat Army are expected to play their hearts out in front of their fans and give them something to cheer about.